Lee College Huntsville Center inmate debaters Craig Caudill (center) and David Mains (right) cross-examine Wiley College senior debater Andre Earls (left) during the second annual George Beto Invitational Debate held Friday Oct. 6, 2017, inside the Huntsville “Walls” Unit prison. 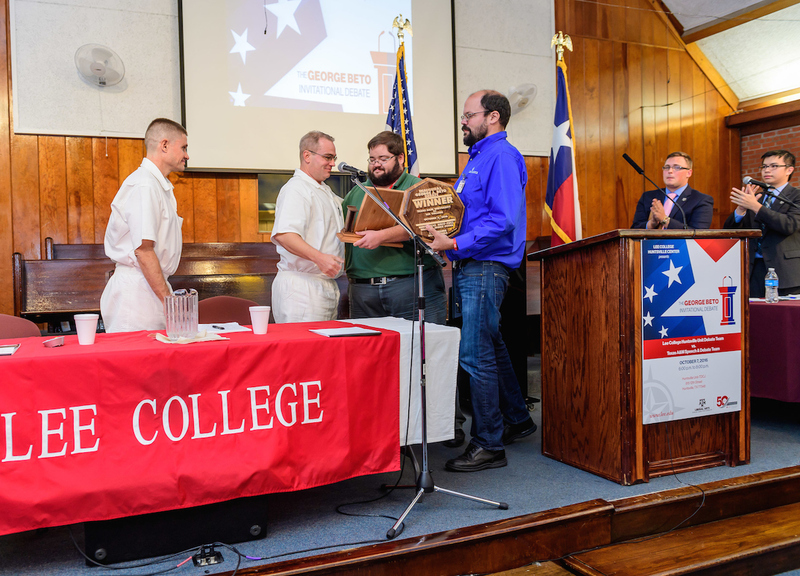 The inmates won the debate in a vote of 4-1, claiming their second victory against a free world college after beating debaters from Texas A&M University last year. 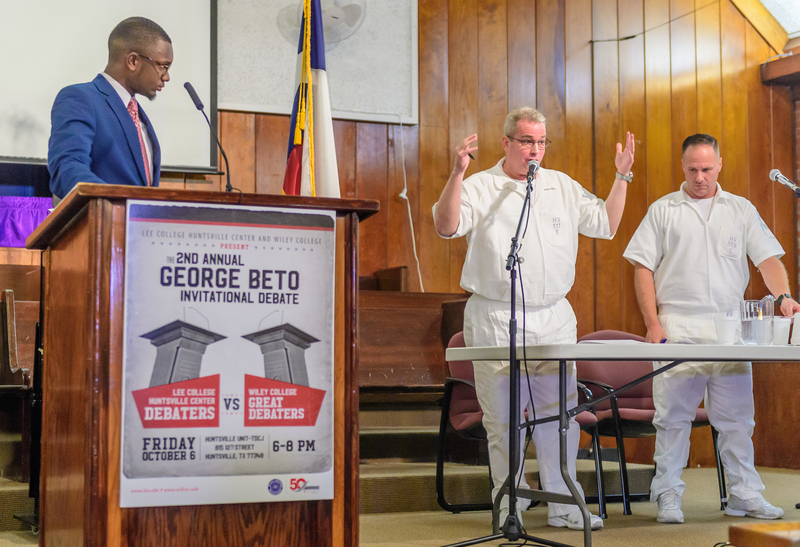 BAYTOWN, TX — Despite besting Texas A&M University last year in the first George Beto Invitational Debate inside the Huntsville “Walls” Unit prison, the inmate debaters from the Lee College Huntsville Center went into the second annual Beto invitational with the Great Debaters of Wiley College this month feeling just as much the underdogs. But the judge’s ultimate 4-1 decision in favor of Lee College — which argued against the resolution that “online education detracts from the college experience” — said something else: they may be locked behind bars without access to the myriad academic and cultural resources of the free world, but these inmate debaters should not be underestimated. To ensure an even playing field for competition, neither Lee College nor Wiley College was given advance knowledge of the resolution to be debated. After narrowing down their topic from a list of five options, the teams were provided the same research materials and 30 minutes to prepare their cases before taking to the podium. Craig Caudill and David Mains, who debated on behalf of the Huntsville Center team, built their argument around several key points: that the college experience is subjective and means something different to every student; that online education can contribute to the college experience by helping students become more independent and responsible; that online education can make the college experience more accessible to more people; and that online education can be a valuable supplement to the traditional on-campus experience. The Lee College Huntsville Center inmate debate team celebrates with Pres. Dr. Dennis Brown (center) and coaches Jeremy Coffman (far left) and Adam Key (far right) after winning the second annual George Beto Invitational Debate, held Friday, Oct. 6, 2017, inside the Huntsville “Walls” Unit prison, against the Great Debaters of Wiley College. At the first Beto invitational held last year, the inmate debate team earned a victory over Texas A&M University. Unlike last year when they had only six weeks to get ready for the debate against the Aggies, the Huntsville Center debaters had a full year to practice their debate skills, polish their deliveries and embrace the lessons learned from their victory the first time around. Senior Warden James Jones also agreed to allow the debaters to spend Friday and Saturday evenings at the unit in preparation for the invitational against Wiley — and national champion coaches Adam Key and Jeremy Coffman joined the team as often as possible to serve as their opponents and offer more seasoned competition. “Debate has gone from being an extracurricular activity to something they actually build their lives around,” said Key, who pursued Wiley College for the team’s next opponent given the institution’s pioneering history in debate. A small historically black college in Marshall, Texas, Wiley earned international recognition in 1930 when its team participated in the first interracial debates in history against the University of Michigan and Oklahoma City University. In 1935, Wiley debaters won the national championship against the all-white team from the University of Southern California. Their story was chronicled in the 2007 film, “The Great Debaters,” starring and directed by Denzel Washington. Though they lost, both debaters from Wiley College said the experience of participating in the George Beto Invitational behind bars would stay with them for life. Freshman Rahmane Dixon said she felt honored to play a role in showing the world that inmates can acquire superior communication skills and offer something valuable to society, and senior Andre Earls even counted the debate against the Huntsville Center team among the highlights of his seven years of competition. HUNTSVILLE, TX – With a growing enrollment of more than 1,200 incarcerated students pursuing associate degrees and certificates, the Lee College Huntsville Center is looking for new adjunct faculty to teach classes part-time at Texas Department of Criminal Justice units in both Huntsville and Navasota. Potential instructors are invited to attend the Huntsville Job Fair to be held from 5-7 p.m., Thursday, Oct. 27, at the Lee College Huntsville Center office, located at 168-C Col. Etheredge Blvd. Participants should bring their resumes to the fair to provide to human resources staff and current faculty, who will be available to answer questions and share insights from their own experiences in the classroom. One of the oldest and largest prison education programs in the United States, the Lee College Huntsville Center needs adjunct instructors for a variety of fields, including: business management, biology, geology, natural sciences, developmental English and writing, development math, standard math, speech and art. Adjuncts will be assigned to teach students at the Eastham, Ellis, Estelle, Ferguson, Holliday, Huntsville and Wynne units in Huntsville, as well as the Luther and Pack units in Navasota. Adjuncts who teach academic courses must have a master’s degree and 18 graduate hours in the discipline being taught. The positions are especially ideal for retired educators and professionals who want to continue using their skills and expertise to make a difference in their community. Data has shown that inmates who complete two years of college behind bars are significantly less likely to return to prison. For more information about working as an adjunct instructor with the Lee College Huntsville Center or the upcoming Huntsville Job Fair, contact the Office of Human Resources at 281.425.6875 or hr@lee.edu. Lee College Huntsville Center inmate debaters Troy Thoele, far left, and Craig Caudill, near left, accept the first-place and winners’ plaques from their coaches Jeremy Coffman and Adam Key as Texas A&M debaters Michael Buse, right, and Anthony Nguyen, far right, offer congratulatory applause. 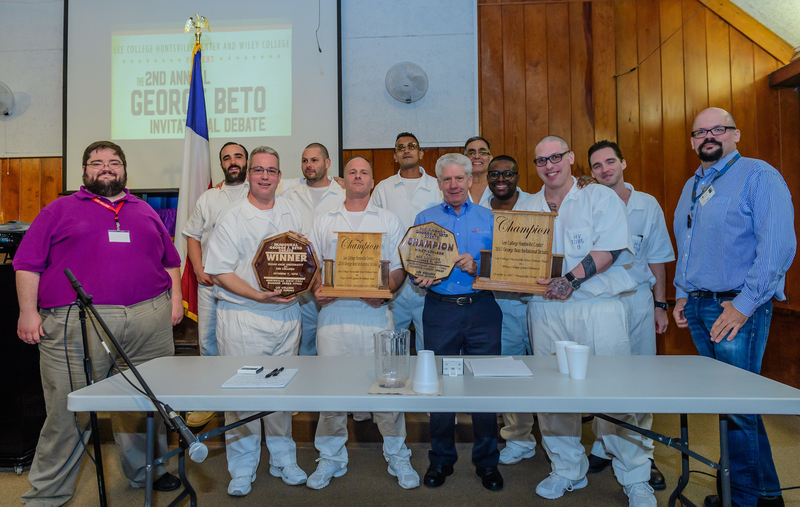 The first-ever George Beto Invitational Debate, held Friday, Oct. 7, inside the Huntsville “Walls” Unit prison, pitted the college’s inmate debate team against the team from Texas A&M. HUNTSVILLE, TX — As they sat inside the chapel of the Huntsville “Walls” Unit prison awaiting the start of the first-ever George Beto Invitational Debate, the inmate debaters from the Lee College Huntsville Center considered the long odds they faced — incarcerated convicts with few academic credentials and limited access to news and information about the outside world, competing against the award-winning debate team from Texas A&M University. But after both teams had laid out their cases for and against the resolution that Donald Trump’s Achilles’ heel is foreign policy, it was the inmates who defeated the Aggies in a 3-2 decision. To Craig Caudill and Troy Thoele, who debated for Lee College, the victory was reminiscent of David’s triumph over Goliath. 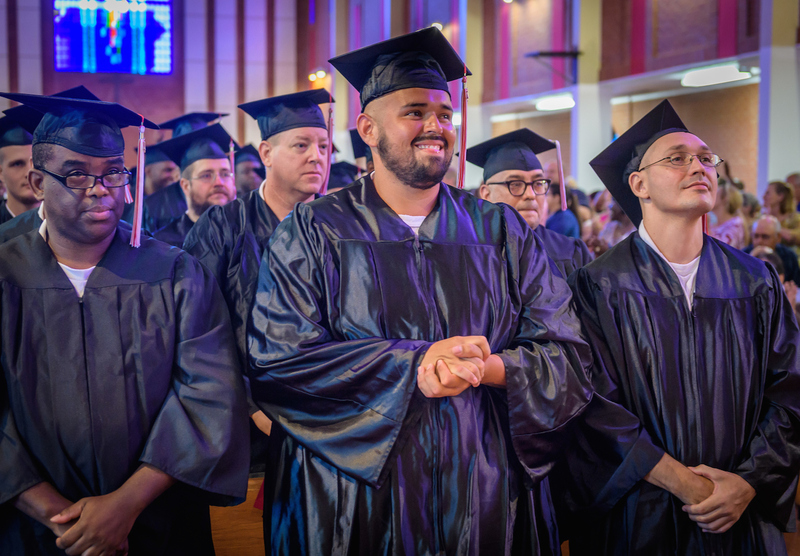 “I feel like I just made parole,” Caudill joked when Lee College was announced the winner and the entire chapel — inmates, wardens and correctional officers, spectators and even the students and coaches from Texas A&M — burst into enthusiastic applause. 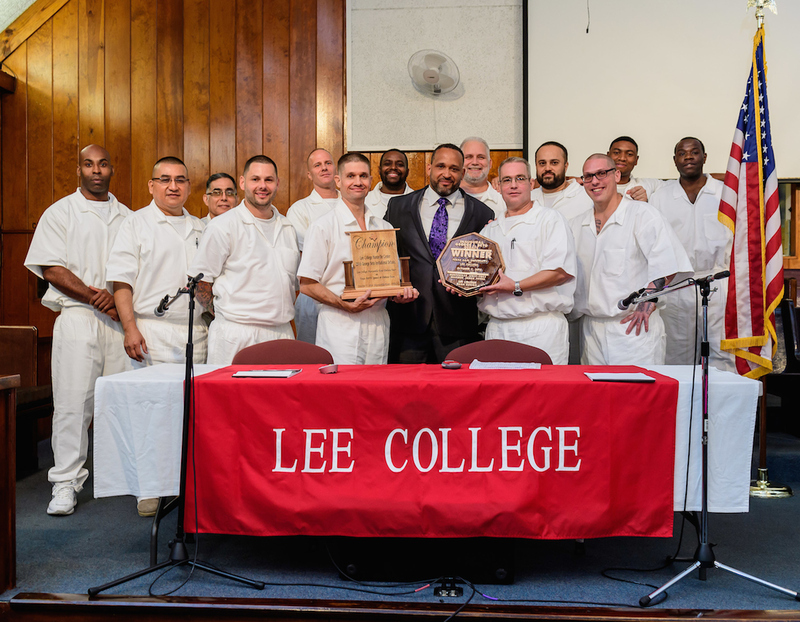 For six months, the Lee College team trained as often as they could within the confines of their strict prison schedule: huddling together on the yard to sharpen their arguments, squeezing in extra practice during study hall in the unit’s education area and even facing off against coaches Adam Key and Jeremy Coffman, champion debaters themselves with nearly a dozen national titles between them. 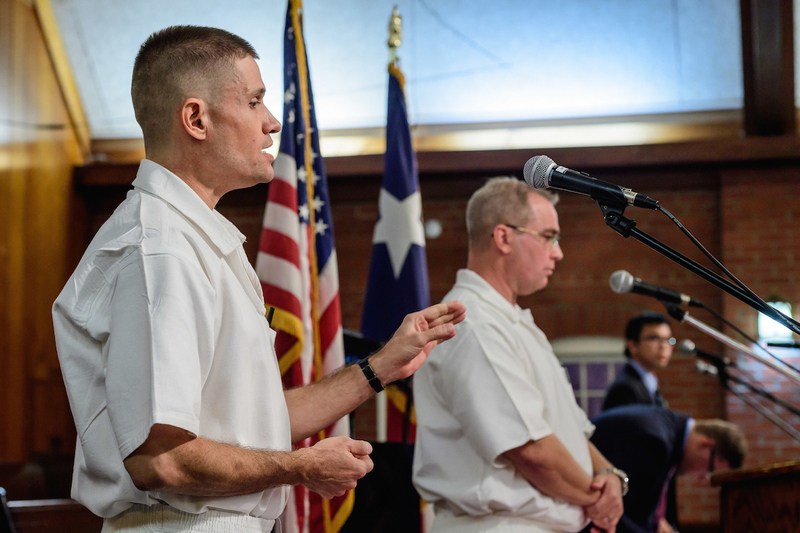 Lee College Huntsville Center inmate debaters Troy Thoele, left, and Craig Caudill, right, argue their case at the first-ever George Beto Invitational Debate, held Friday, Oct. 7, inside the chapel at the Huntsville “Walls” Unit prison. The inmate debate team bested the speech and debate team from Texas A&M University in a 3-2 decision. To ensure an even playing field for competition, neither team was given advance knowledge of the resolution to be debated. After narrowing down their topic from a list of five options, the teams were provided the same research materials and 30 minutes to prepare their cases before taking to the podium. Caudill and Thoele gathered in the back of the chapel with their teammates and coaches, scanning newspaper articles for information and bouncing ideas and potential angles around the group. Lee College built their argument around Trump’s rise to the top of the Republican presidential ticket despite his controversial remarks, his unstable foreign policy approach that could jeopardize America’s relationships with other countries and inability to be a strong and respected leader. Michael Buse and Anthony Nguyen of Texas A&M argued that Trump’s primary weakness is actually his temperament, which has caused him to speak and behave in a way that has alienated women and minority voters and made him less likely to accept counsel from advisers. A panel of five judges — Hassan Assad, a professional wrestler better known by the moniker “MVP;” Jason Bay, pastor of First Baptist Church Huntsville; Dessie Cherry, a former warden and retiree from the Texas Department of Criminal Justice; Allen Hightower, a former Texas legislator; and Raymond Middleton, a volunteer chaplain at the Walls Unit — ultimately decided the inmate debaters had best proved their case. Hassan Assad, a professional wrestler better known as MVP, congratulates the Lee College Huntsville Center inmate debate team after their defeat of Texas A&M University at the first-ever George Beto Invitational Debate held Friday, Oct. 7, inside the chapel at the Huntsville “Walls” Unit prison. A convicted felon who served more than 9 years in the Florida prison system, Assad returned behind bars to judge the debate competition and encourage team members to continue pursuing opportunities to better themselves before release. Though Caudill and Thoele were the only ones to take the debate stage, both described the Lee College victory as a group effort. The help of their teammates and coaches was invaluable, and Senior Warden James Jones and Assistant Warden Matt Dobbins of the Walls Unit were instrumental in making the debate program a reality behind bars. Even their fellow inmates throughout the prison were excited about the debate and offered the team words of encouragement and best wishes, they said.